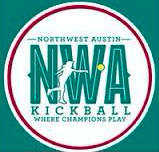 NWA Kickball sign up for girls 5 to 18 years old, 40th year! NWA Kickball will have free clinics at the NWA Kickball fields at 3701 Far West Blvd from 2-4pm on Sunday, Nov 12th and Nov 26th. The clinics are open to girls between the ages of 5 to 18 years old, all skill levels, and we encourage you to bring your friends. Many of the girls’ favorite coaches will be there to teach kickball skills, play some games, and most importantly make sure they have fun! If you aren’t able to attend the clinics but want to play in the Spring, registration will be open at www.nwakickball.com in mid December.